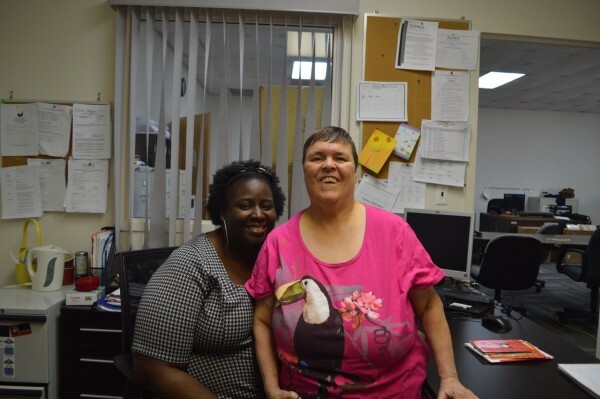 Tracey Suk has lived in her own apartment with support services from Everas since 1995, when she moved from the Vineland Developmental Center for people with intellectual and developmental disabilities. Kind hearted, vivacious and friendly, Tracey easily adapted to life in the community with increased options and choices for how she wanted to lead her life. Lena Johnson is the Director of Residential Services Southern Region for Everas. Lena began her career with Everas as a part-time residential specialist in the apartment where Tracey resides, in 1998. Growing up with deaf grandparents, Lena developed an interest in sign language at an early age. As Everas specializes in services for people with sensory impairments, she thought working at Everas would be a fitting opportunity. Little did Tracey and Lena know that what began as a new opportunity for each of them would lead to a special bond and lifelong friendship. While Lena’s work was what initially brought the duo together, their relationship remains despite the fact that Lena’s responsibilities no longer involve Tracey’s day to day care. Lena and Tracey continue to share in life’s joys and disappointments from holiday celebrations through difficult times such as the loss of family members. They make time to go out for meals together, text and face time each other and spend afternoons shopping or just enjoying each other’s company. Tracey is strong willed and spirited. She is generous with her affection, has an infectious smile, and shows genuine care and concern for her friends’ wellbeing. She is helpful and dotes on her peers, making sure that everyone’s needs are met. Tracey is deaf and communicates through gestures and actions to get her point across. She enjoys holiday dinners with Lena’s extended family, and loves to spend time and take care of Lena’s nieces and nephews. Lena is also strong willed, spirited and generous with her affection. She is a powerful advocate in word and deed. Lena explains, “treat a person with a disability like you would anyone else. After all, Tracey wants and needs the same things I do – love, support and encouragement”. Lena easily shares these things with Tracey, and Tracey easily reciprocates. Lena says it doesn’t matter that Tracey cannot tell her exactly what is on her mind, “I can tell by a facial expression, movement or behavior exactly what Tracey needs”. When you see first what a person can do, what they can’t doesn’t matter at all.